This photo knocked even my husband sideways. We decided that it was the squeaky passport that did him in (for me, it’s Ralph’s perfect air-host demeanor — he’s just so well turned-out! ), so I looked on-line for squeaky passport toys, and found one on Amazon (as of today, though, they’re sold out, so here’s an alternative source). Here is it from the front, still in its plastic bag, because wouldn’t it be a fun thing to give away? 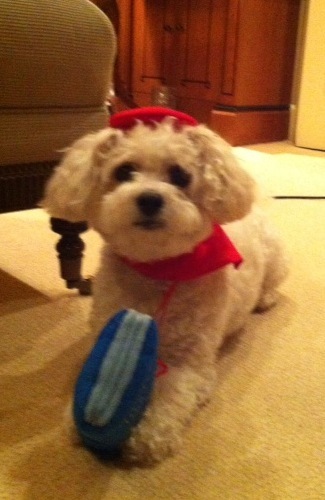 Thanks so much, Anne, for letting me post Ralph’s picture! I hope you guys have a wonderful time in Paris, and that you send us more pictures. Ok, so I’m really confused and I apologize for taking your time but am I signed up as a subscriber or not? I can not tell. Also if I am how does one enter the giveaways? Please help and I apologize again if this is an easy process that I am not understanding! Hi, Judith — I don’t see your e-mail in the subscribers list, so it looks like you aren’t. Would you try again, using that button at the top of the left sidebar? It should give you a small form to fill out, and then thank you (I’m thanking you too!). I haven’t yet sent out Dog Jaunt’s first newsletter, but when I do (and it should be within the next week or so — I’ll make a fuss), the instructions for entering the giveaway will be in there. Thank You! For your help. I have no idea what I was doing wrong but I can easily see that I am now a confirmed subscriber!!! While I have a chance, Thank You for all the extremely useful information Dog Jaunt has provided for me. It is greatly appreciated!!! !